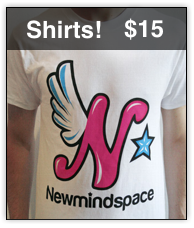 All over the world, groups like Newmindspace organize free, fun, all ages, non-commercial public events. From a massive Mobile Clubbing event in a London train station to a giant pillow fight near the Eiffel Tower in Paris to a subway party beneath the streets of Toronto, it is clear that the urban playground is growing around the world, leaving more public and more social cities in its wake. This is the urban playground movement, a playful part of the larger public space movement. One of our goals at Newmindspace is to make these unique happenings in public space become a significant part of popular culture, partially replacing passive, non-social, branded consumption experiences like watching television. The result, we hope, will be a global community of participants in a world where people are constantly organizing and attending these happenings in every major city in the world.